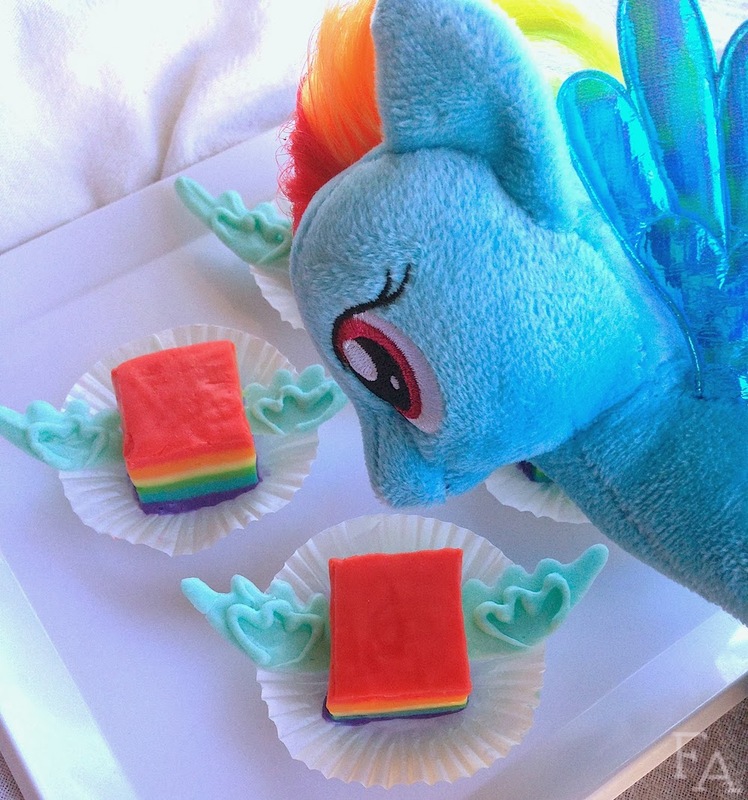 Fiction-Food Café: Rainbow Dash Fudge for "My Little Pony: Friendship is Magic"
Rainbow Dash Fudge for "My Little Pony: Friendship is Magic"
Smalls and I stumbled upon "My Little Pony: Friendship is Magic" last year, like so many other shows, via Netflix. I had known about "MLP:FiM" for a few years but having grown up with the original 80s "My Little Pony" (toys & cartoons) I was averse to the drastic style and basically everything change of the new show. After Smalls randomly clicked on it in the Netflix Kids section though, and we watched a couple of episodes, I didn't think it was all that bad, in fact I pretty much fell in love with it even though it is completely saccharine (like this recipe!). There are a lot of clever inclusions in the show (like Doctor [W]hooves & Pinkie Pie's "Transformers" sound effect in "Equestria Girls") and the world is waaaay more fleshed out and the characters more developed than they ever have been. Smalls has designated me as Apple Jack (perhaps because I bake?) 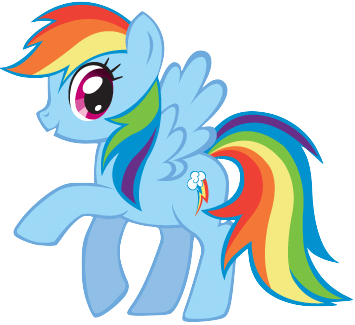 while her favorite character is the loyal and feisty Rainbow Dash (shown upper right). 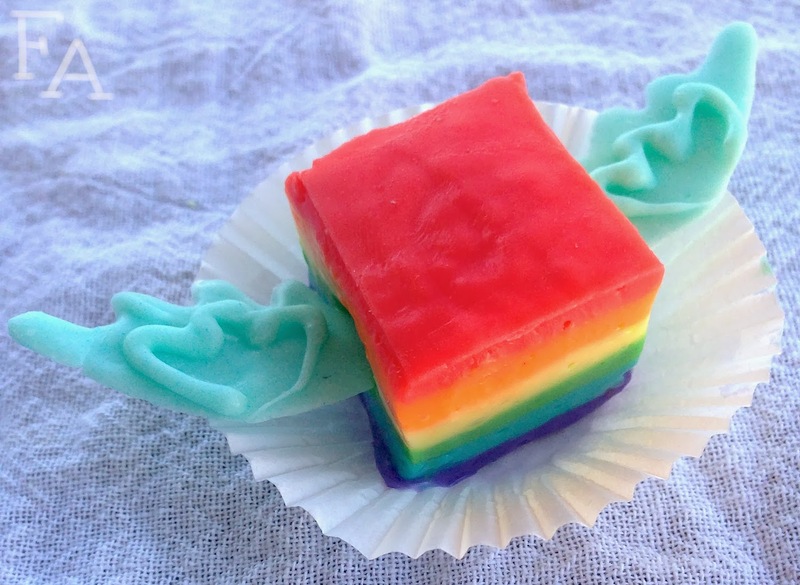 I wanted to celebrate the show and Smalls' sometime alter ego so I came up with this very simple twist on rainbow fudge. 1. Line an 8x8 in. pan with foil or plastic wrap & then spray it lightly with non stick spray. In a small bowl combine 1 cup white chocolate, 1/2 cup condensed milk, a pinch of salt, & 1/2 tsp. of flavoring (I actually used vanilla & orange extract, 1/2 tsp. of each). Microwave for 30 seconds, stir well, & then microwave for 15 secs. more & stir again until the chocolate is completely melted. Thoroughly stir in enough violet gel paste to make a dark purple (I used 4 drops) & then pour the resultant mixture into the waiting pan. Stick in the freezer on a completely flat surface for about 15 minutes to set. Just before the 15 mins. is up, make the next batch of melted chocolate, this time in a vibrant turquoise (I used 3 drops of sky blue). Pour this blue mixture on top of the purple & gently & evenly spread it out, making sure to get into the corners. Put the pan back in the freezer for another 15 minutes. Continue this process until you have all six color layers (just FYI, I used 2 drops leaf green + 1 drop lemon yellow for the spring green layer, 1 drop of lemon yellow for the pale yellow layer, 5 drops orange for the deep orange layer, & I think it was 3 drops of red for the plain red layer—I forgot to write that one down!). Once the red layer is on, place the filled pan into the freezer for about 30 mins. & then transfer to the fridge for several hours or over night. 2. Once the fudge is solidified, turn it out onto a work surface of paper towels & peel off the foil or plastic. 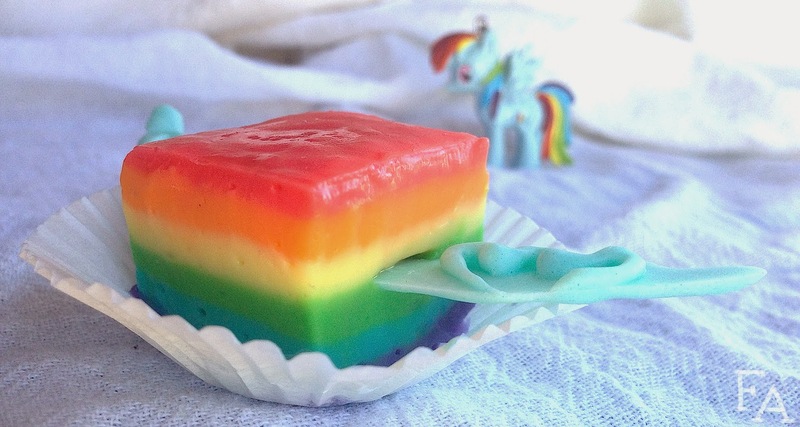 Run a large, sharp knife (or pizza cutter) under very hot water & then slice the fudge into ~1" cubes. Cut until the fudge begins to stick to the blade signaling the need to run the knife under very hot water again to continue cutting. Repeat the hot water on the knife until all of the fudge is cut into cubes. 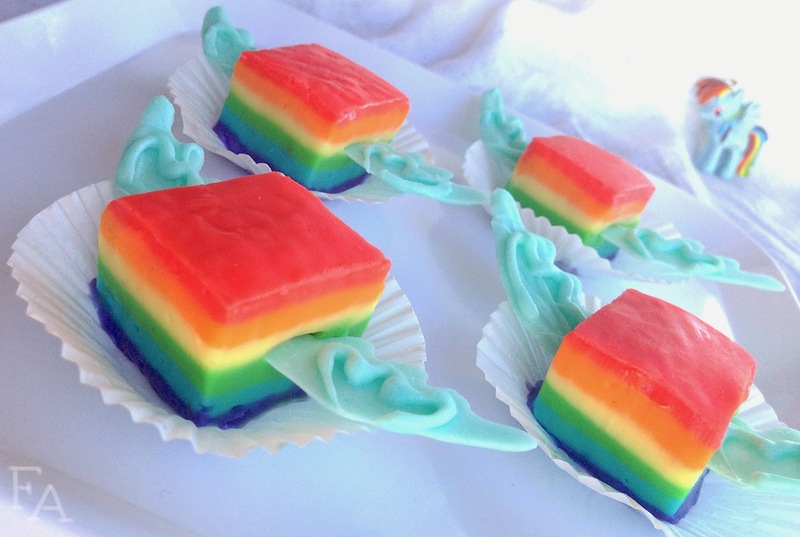 Place each cube into a white candy cup. 3. (You can work on this step between steps 1 & 2 if you want). In a small bowl melt 1/2 cup white chocolate OR light blue candy melts, stirring in a tiny amount of oil to make it thinner/more workable if needed (I used a little bit of coconut oil & it gave a great hint of flavor). If using white chocolate, thoroughly stir in 1 drop of sky blue gel paste (perhaps 1 drop of regular blue would be even better as sky blue is a little teal-y). Print out & place the wing template on a large baking tray. Place a sheet of parchment paper over top & secure it with small magnets (you can try tape but it doesn't stick well on parchment!). Spoon the blue chocolate into a candy decorating bag with a tiny opening or a decorating squeeze bottle & then, working on one wing at a time, trace & fill in the wing shapes (using a toothpick to fine tune if needed). Once all of the wings are done let set until hardened & then carefully squeeze on the top wing embellishment as shown in the picture above to the right. Let set again until fully hardened. 4. Run a butter knife under very hot water &, working with one fudge piece at a time, slide the tip of the knife into either side, just between the green & yellow layers, to create slits. 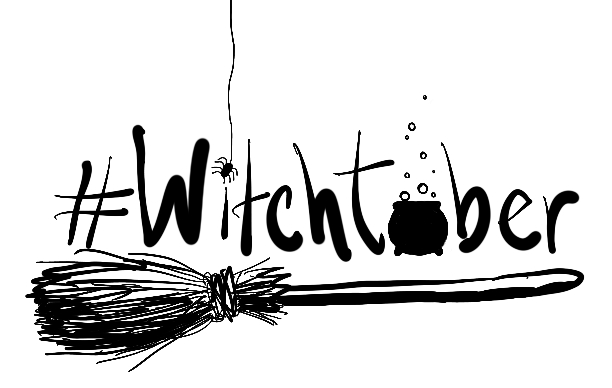 Do this to each piece of fudge in preparation for affixing the wings. To handle the chocolate wings run your hands under cold water & dry completely (this will cool of your hands, repeat as necessary). Remove the wings from the parchment paper by gently each one up from behind the paper (shown above in the middle image). Very carefully (so as not to break the wing tips) slide/press each wing into a slit on the appropriate side of the fudge pieces (right wing, left wing, see image directly above the recipe for reference). Store in fridge until ready to serve! Very awesome as party treats. 1st of all, I friggin' love your site! Thing is though, um... I have never seen the 80's version of the My Little Pony cartoon (sorry about that). I have to admit, rather embarrassingly, as a 17 year old high school junior already looking at colleges... I like FIM. It's very popular among grown men, y'know. Bronies? Have you ever heard of them? I have to admit, it's one of the best versions of a continuation/kinda reboot of an 80's franchise that i've seen. Who is your favorite character? Actually, "Pinkie Pie" would be a lot more applicable to you since you like to bake, and so does she... Applejack does not bake in the series at all. Oh, and your feelings about the characters/80's version and your initial reluctance to watch it and then falling in love with it... have you ever seen the 2011 version of "ThunderCats"? It only lasted one season, but it's fantastic. However, it's a lot darker than the 80's version and focuses on tough subjects like racism and war a la "Avatar" or "Legend of Korra", as well as more development for the characters. Also, Snarf doesn't talk in this version, he just says "Snarf" like a pokemon, and it is so cute... Though there are more similarities to Korra in terms of themes and animation style than anything else... there is a ton of inspiration in terms of food, and the animation is beautiful. Unfortunately, you can't get that version of it on "Netflix" so you might have to look for it on Amazon or something like that. Very animeesque. Just look up "ThunderCats 2011" and it'll pop up. In some form. It's more for older teens though. Sometimes it screens on Toonami on Adult Swim. Also, this looks awesome for a kid's party. Am I right or AmIRite. Who's your favorite FIM character? Is it Applejack or is it someone else? Please let me know. Just enter (or copy and paste) that link into the browser above you, and it'll take you there. 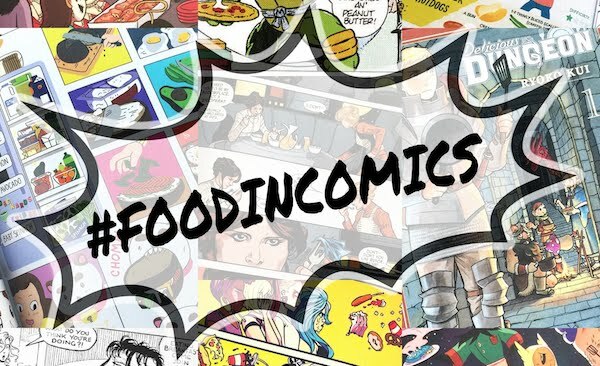 Even though you might be reluctant, I know you love Korra (the show I made comparisons to this show about and have a crap-ton of recipes for)... trust me, once you first watch the first episode, you'll get sucked in. Or, rather, just click on it, as the thing is highlighted for you below.